Today, the Centre for International Languages was officially invited by Zainee to UiTM Arau nearby for their Geomatics Carnival 2018 exhibition. 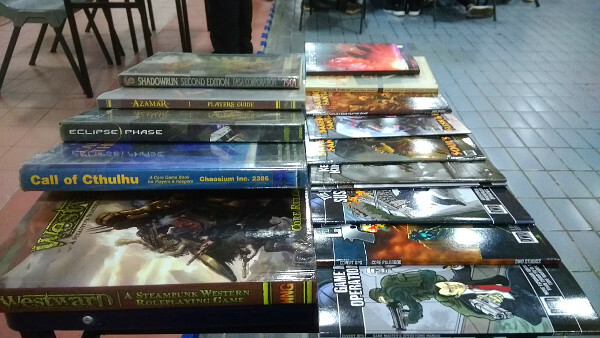 There was a hobbies exhibition section where I set up shop with tabletop RPGs with my colleague Bazli. I would talk to visitors about using RPGs as a language learning tool. Also, to run games if and when I can. Sharnizan of Serious Games UUM was also present to introduce and sell his product the Ace of Maths game to UiTM students. Though at this point he was explaining the card game to Bazli. There was no dearth of visitors to our tables when the exhibition started. The exhibition organisers even provided Bazli and I with a packed lunch. My usual suspects line up was arrayed for display at their table, eliciting enquiries once in a while. I ran two game sessions for visitors. I ran the Edge of the Empire/Age of Rebellion for a group of four students before lunch. I ran DwD Studios’ BareBones Fantasy for a group of two after lunch. Click on the links above to read the actual play report of both game session. The hall was quite packed with visitors who quickly transitioned into players. I try my best to explain that RPGs were typically played without any boards or pieces and only with verbal interaction and dice to randomise task resolution of characters. Elsewhere, there were boards. These schoolchildren are trying out Subbuteo, which I remember desparately wanting to buy when I was younger than these students thanks to advertisements in British comics and Shoot magazine in the early 1980s. The boardgames were brought by Nur Iskandar of LifeLong Gamers so that these ladies could be the Champions of Midgard. The LifeLong Gamers table is spectacular. These were all for sale during the exhibition. At the end of the day, the hobbies section of the Geomatics Carnival took a photo together and hoped that we could do this again someday! Posted in Board and Card Games, Recent News, Role Playing Games, Teaching and tagged board game, card game, exhibitions, rpg, teaching, work excursion.